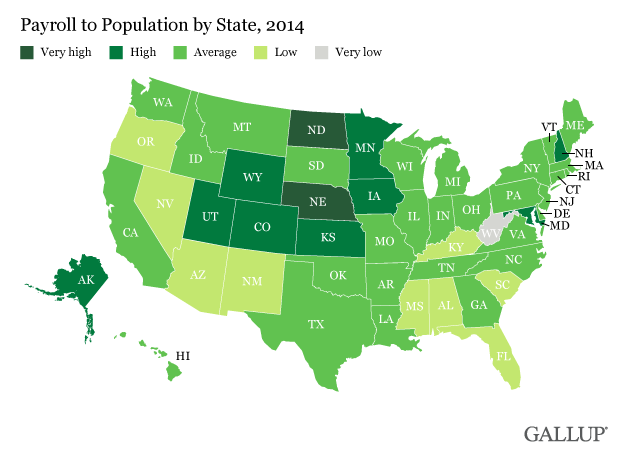 WASHINGTON, D.C. -- Last year, North Dakota (54.0%) had the highest Payroll to Population employment rate (P2P), as measured by Gallup, among the 50 U.S. states. A cluster of states in the northern Great Plains and Rocky Mountain regions -- including Nebraska, Minnesota, Kansas, Wyoming, Utah, Colorado and Iowa -- all made the top 10 on this measure. 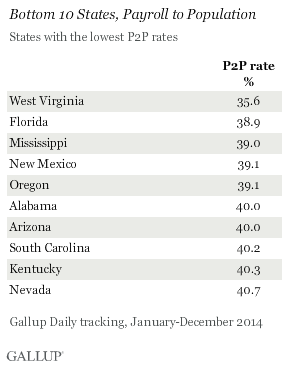 West Virginia (35.6%) had the lowest P2P rate of all the states for the second year in a row. Gallup's P2P metric tracks the percentage of the adult population aged 18 and older who are employed full time for an employer for at least 30 hours per week. P2P is not seasonally adjusted. These results are based on Gallup Daily tracking interviews throughout 2014 with 353,736 U.S. adults. Gallup does not count adults who are self-employed, work fewer than 30 hours per week, who are unemployed or are out of the workforce as payroll-employed in the P2P metric. The differences in P2P rates across states may reflect several factors, including the overall employment situation and the population's demographic composition. States with large older and retired populations, for example, would have a lower percentage of adults working full time. The two states with the lowest P2P in 2014, West Virginia and Florida, have two of the largest proportions of residents aged 65 and older, at 17.3% and 16.9%, respectively. Regardless of the underlying reason, however, the P2P rate provides a good reflection of a state's economic vitality. Aside from the Mountain West and northern Plains states, those states bordering the nation's capital and located in the Northeast also showed higher levels of full-time employment for an employer. Washington, D.C., had the highest P2P rate of any area in the country, at 56.4%, but it is unique in being the only entirely urban region in the survey, heavily dominated by the presence of the federal government, and with one of the lowest percentages of residents aged 65 and older (12.3%). As with P2P rates, states in the northern Great Plains and Rocky Mountain regions -- including North and South Dakota, Minnesota, Nebraska and Iowa -- were among those with the lowest unemployment rates in 2013. 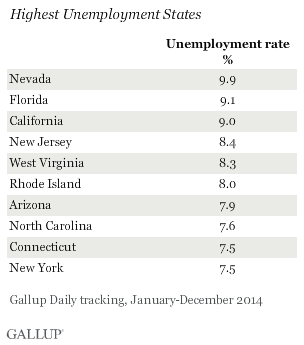 The five states with the lowest unemployment rates were all also in the top 10 for P2P rates in 2014. Similarly, four of the 10 worst-performing states in terms of unemployment were also in the bottom 10 for P2P, and also lowest ranked in 2013. Gallup's U.S. unemployment rate is the percentage of adults in the workforce who are not employed but are looking and available for employment. While P2P reflects the proportion of adults working full time for an employer relative to the entire population, the unemployment rate reflects the proportion of adults in the workforce -- all those working or seeking work -- who are not working, but would like to be. P2P and unemployment are both objective indicators of the employment situation, and as such, there is a great deal of overlap on these two metrics among the best- and worst-performing states. The measures also correspond with the best and worst performers on Gallup's Economic Confidence Index and Job Creation Index, which provide a more attitudinal assessment of the state's economic and employment picture. North Dakota figures in the top 10 and West Virginia in the bottom 10 on both 2014 state lists on these other two measures. However, across all states, P2P shows a stronger relationship than do unemployment rates with other important economic indicators. 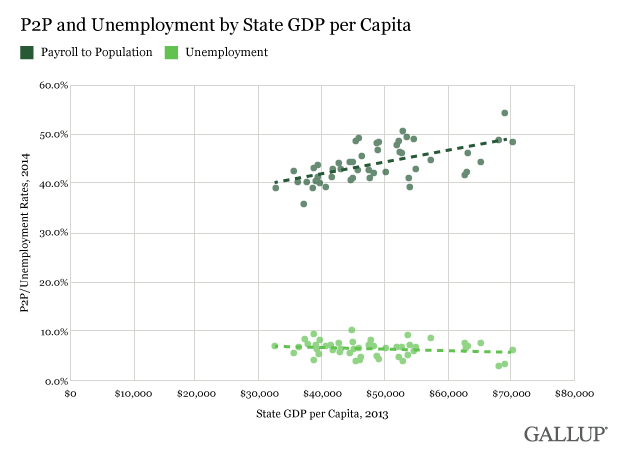 For example, P2P tracks positively with state GDP per capita, while unemployment shows little relationship. The top 10 states for P2P tend to have several things going for them, economically. More than half of the states with the highest P2P rates in 2014 ranked in the top 10 for P2P in 2013, thus showing persistent economic strength as the country continues to recover from the Great Recession. Additionally, North Dakota, Wyoming, Nebraska, Utah, Kansas and Iowa in 2014 all ranked in the top 10 states for P2P and bottom 10 for unemployment, indicating these states have particularly robust labor markets. 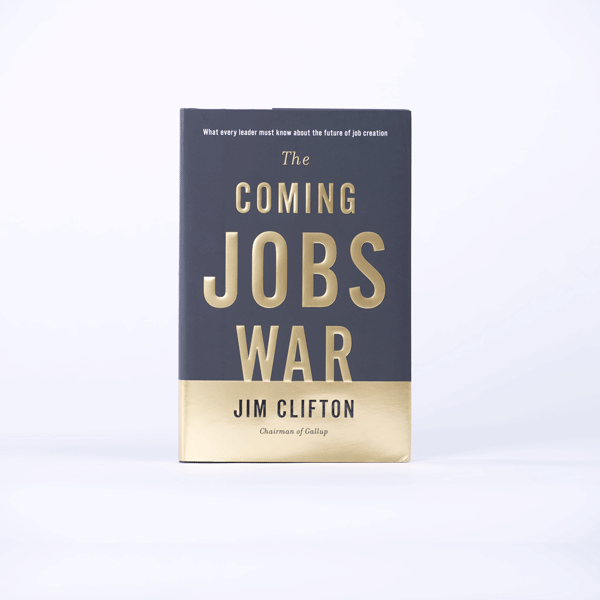 North Dakota, Nebraska, Iowa and Utah ranked in the top 10 on Gallup's Job Creation Index, meaning the positive hiring situation in those states is particularly evident to workers in these states. Alaska, North Dakota and Wyoming also boast the three highest per capita incomes. By contrast, West Virginia, Florida, Arizona and Nevada in 2014 ranked in the bottom 10 states on P2P rates, and they are among the states with the highest unemployment rates. Many of these same states ranked among the lowest on these measures in 2013, as well. The 2008 recession hit these states harder than it did many others. For instance, Nevada, Florida, and Arizona saw the highest foreclosure rates in the nation, and years later, these states still lag behind others on employment, job creation and economic confidence. As the national economy strengthens in the northern Great Plains and Northeast, these lower-ranking states risk being left behind unless they can find ways to put more of their population into productive full-time employment. Results for this Gallup poll are based on telephone interviews conducted Jan. 2-Dec. 30, 2014, on the Gallup U.S. Daily survey, with a random sample of 353,736 adults, aged 18 and older, living in all 50 U.S. states and the District of Columbia. For results based on the total sample of national adults, the margin of sampling error is ±1 percentage point at the 95% confidence level. Margins of error for individual states are no greater than ±6 percentage points, and are ±3 percentage points in most states. The margin of error for the District of Columbia is ±6 percentage points. All reported margins of sampling error include computed design effects for weighting. State GDP figures for 2013 are taken from the Bureau of Economic Advisors, and the per capita GDP figures are derived by dividing each state's GDP by the 2013 Census Bureau estimates of state population. State GDP data for 2014 is scheduled for release in June 2015.